Aluminum Paint Stripping Products that Restore Original Surface Quality. Aluminum Wheel Stripping - Frequently Asked Question. Sample Q. Can MILES Chemical Solutions #8648 Low-Temperature Aluminum Wheel Stripping Concentrate Product be used to Strip Clear Coat, Paint and Powder Coatings from Aluminum Wheels? Sample A. 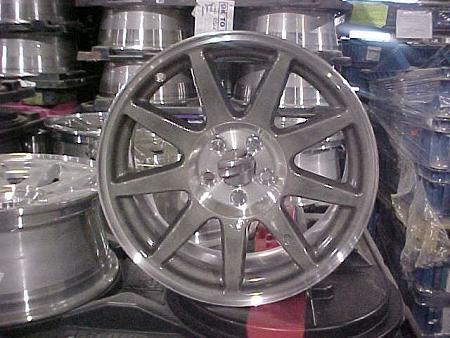 Yes, MILES Chemical Solutions #8648 Low-Temperature Aluminum Wheel Stripping Concentrate Product can be used to Strip Clear Coat, Paint and Powder Coatings from All Alloy Aluminum Wheels? Q. What are the advantages of stripping my paint rework parts in-house? Q. What are the advantages of MILES new proprietary paint strip chemistries, when compared to other stripping technologies available? Q. Will MILES proprietary paint strip process strip liquid applied, (cured) paint as well as stripping powder coat paints? Q. What is the strip time for most production painted parts? Q. Can you use MILES new proprietary paint strip process for stripping racks and fixtures? Q. Can MILES new proprietary paint strip process be used on multi-metal substrates? Q. Will my rinse water and spent strip solution be regulated or non-regulated? Q. Will MILES new proprietary paint strip process alter my pretreatment coating, chromate conversion coating or zinc phosphate coating weight or morphology? Q. What type of equipment is recommended to utilize MILES proprietary paint strip solutions? Q. Where can I purchase a hot strip process tank capable of utilizing MILES new proprietary paint strip solution? Q. How long will MILES new proprietary paint strip solution last? Q. Can I purchase a 1-gallon or 5-gallon sample to test panels or wheels at our location? 1 - Q. What are the advantages of stripping my paint rework parts in-house? A. #1. The most important advantage of stripping your paint rework parts in-house is the opportunity to maintain quality under your roof, without damage that can occur in handling during transportation to and from the paint strip service location. #2. Reduced turn-around time, in most cases reduced from 3 to 5 days, to 1 to 2 hours stripping in-house. #3. Cost Savings in-house, when compared to added service and transportation costs. 2 - Q. What are the advantages of MILES new proprietary paint strip chemistries, when compared to other stripping technologies available? A. The advantages of MILES new proprietary paint strip technologies are all so significant that it's hard to place them in any particular order of importance. (a) MILES proprietary formulas are environmentally more friendly than hazardous regulated chemical technologies. MILES proprietary paint strip processes are more operator friendly. (b) MILES new proprietary technologies leave the substrate surface in like-new condition with original surface quality. 3 - Q. Will MILES proprietary paint strip process strip liquid applied, (cured) paint as well as stripping powder coating paints? 4 - Q. What is the strip time for most production paint rework parts? A. The strip time in most cases is directly related to the paint film build on the parts. Most OEM production painted parts have a dry paint film build of from 1 mil up to 10 mils. MILES proprietary paint strip process can remove paints up to 10 mils of paint in 30 minutes to a maximum of 1 hour for stripping automotive coatings that incorporate e-coat, base coat and clear coat coatings. 5 - Q. Can you use MILES new proprietary paint strip process for stripping racks and fixtures? A. When thinking about paint stripping hooks, racks and fixtures with MILES process, the yes and no answer revolves around paint film build. Yes, if you can turn around the racks and fixtures, in order to maintain the paint build-up under 10 mils. No it does not make sense to use chemistry for use on hooks, racks and fixtures that have paint build-up in excess of 10-20 mils. Stripping E-coat hooks, racks and fixtures is a good application for MILES chemical strip processes, due to the fact that E-coat does not build a high film build on the hooks & racks. 6 - Q. Can MILES new proprietary chemical paint strip products be used on multi-metal substrates? A. Yes, MILES new proprietary paint strip products can be used to strip paint from aluminum, magnesium, brass & non-ferrous substrates in addition to removing paint coatings from TPO & other plastic substrates. 7 - Q. Will my rinse water and spent strip solution be regulated or non-regulated? A. Environmental restrictions are different in many locations, however many of MILES proprietary paint strip solutions are non-regulated, Non-HAP and Non-SARA. Special attention should be taken to verify the paints being stripped are of a non-regulated and non-hazardous make-up, in which case the rinse water and spent strip solution will also be non-regulated. 8 - Q. Will MILES new proprietary paint strip process alter my pretreatment coating, chromate conversion coating or zinc phosphate coating weight or morphology? A. No, MILES new proprietary strip process has demonstrated no adverse affect on zinc phosphate coating weight or morphology. In addition, we have seen no affect on chromate conversion coatings, this is important in keeping the chromate from leaching into your strip solution. 9 - Q. What type of equipment is recommended to utilize MILES proprietary paint strip solutions? A. Equipment requirements to consider to properly utilize MILES proprietary paint strip process are as follows: (a) A heated, insulated strip tank with a lid. (b) adequate exhaust, MILES paint strip solution vapor when heated is not a HAP and in most cases, can be exhausted outside the facility. (c) an agitation mixer capable of circulating the MILES paint strip solution through the parts. 10 - Q. Where can I purchase a hot strip process tank capable of utilizing MILES new proprietary paint strip solution? 11 - Q. How long will MILES new proprietary paint strip solution last? A. With regular additions of MILES new proprietary stripping solution, to make-up for carry-out and regular removal or decanting of the precipitated paint sludge, stripping solutions may last from 1-2 years. Performance is maintained with regular additions of MILES new proprietary solutions. 12 - Q. Can I purchase a 1-gallon or 5-gallon sample to test panels or wheels at our location? A. Yes, MILES CHEMICAL SOLUTIONS offers 1-gallon and 5-gallon samples at $34.85/gallon, plus shipping for each of our stripping solution technologies. Visit The Powder Coating Industries Latest Directory, Place your company at the Top of your States Category Today!